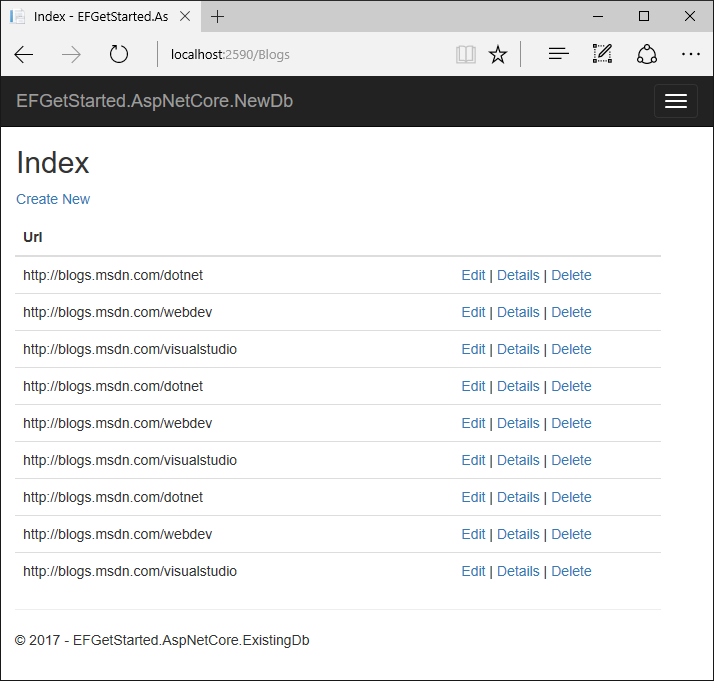 In this tutorial, you build an ASP.NET Core MVC application that performs basic data access using Entity Framework Core. You reverse engineer an existing database to create an Entity Framework model. This tutorial uses a Blogging database on your LocalDb instance as the existing database. If you have already created the Blogging database as part of another tutorial, skip these steps. To install EF Core, you install the package for the EF Core database provider(s) you want to target. For a list of available providers see Database Providers. For this tutorial, you don't have to install a provider package because the tutorial uses SQL Server. 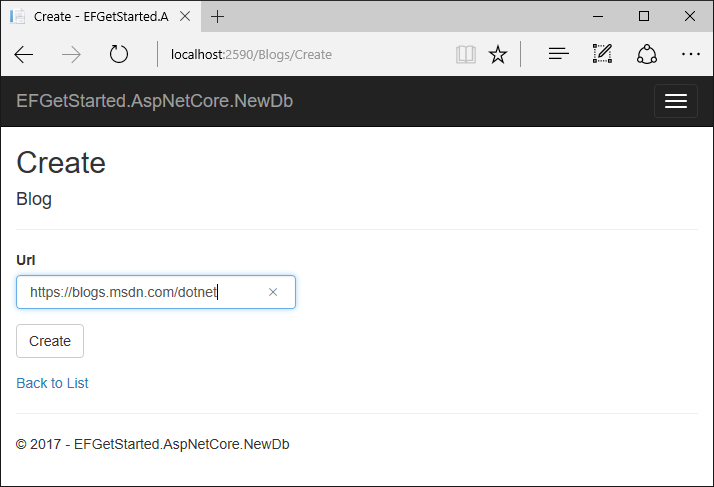 The SQL Server provider package is included in the Microsoft.AspnetCore.App metapackage. Now it's time to create the EF model based on your existing database. If you receive an error stating The term 'Scaffold-DbContext' is not recognized as the name of a cmdlet, then close and reopen Visual Studio. You can specify which tables you want to generate entities for by adding the -Tables argument to the command above. For example, -Tables Blog,Post. The reverse engineer process created entity classes (Blog.cs & Post.cs) and a derived context (BloggingContext.cs) based on the schema of the existing database. To enable lazy loading, you can make navigation properties virtual (Blog.Post and Post.Blog). The context represents a session with the database and allows you to query and save instances of the entity classes. #warning To protect potentially sensitive information in your connection string, you should move it out of source code. See http://go.microsoft.com/fwlink/?LinkId=723263 for guidance on storing connection strings. The concept of dependency injection is central to ASP.NET Core. Services (such as BloggingContext) are registered with dependency injection during application startup. Components that require these services (such as your MVC controllers) are then provided these services via constructor parameters or properties. For more information on dependency injection see the Dependency Injection article on the ASP.NET site. To make BloggingContext available to MVC controllers, register it as a service. Now you can use the AddDbContext(...) method to register it as a service. In a real application you would typically put the connection string in a configuration file or environment variable. For the sake of simplicity, this tutorial has you define it in code. For more information, see Connection Strings.